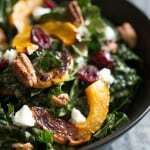 A luscious and bold fall salad with roasted delicata squash, fresh chèvre, dried cranberries and sweet and spicy pecans. Cut delicata in half lengthwise and scoop out seeds and stringy pulp from the center of the squash cavity. Trim ends and stem and then cut squash into half moons, each about ½-inch thick. Toss delicata squash, oil, salt and pepper in a medium bowl. Spread the squash out on the baking sheet and roast until the squash is tender, stirring once or twice with a spatula, 15 to 20 minutes. Meanwhile, toss kale with dressing in a large bowl.